If Texas elects to Congress a slate of new conservative leaders it will be in no small measure due to the efforts of principled limited government constitutional conservative Senator Ted Cruz. Cruz, facing his own reelection campaign this year, has still found time to make endorsements in at least four hotly contested Texas GOP House primaries. As of this date Cruz is supporting candidates in the 2nd, 3rd, 5th and 21st Congressional Districts. Two of the candidates he endorsed are his former staffers: Jason Wright in District 5 and Chip Roy in District 21. Ballotpedia reports that six open congressional seats now held by Republican incumbents are gathering most of the attention heading into the March 6 primaries. Particularly contentious primary fights are occurring in the 2nd, 5th, and 21st congressional districts, where Cruz has chosen to back a conservative among the multiple high-profile candidates who are running. In Texas Congressional District 2, Senator Cruz is backing GOP activist Kathaleen Wall to fill the seat of retiring Rep. Ted Poe. Cruz has been joined by national figures such as House Republican Conference Chairman Rep. Cathy McMorris Rodgers, Texas Gov. Greg Abbott (R) and Texas Attorney General Ken Paxton (R) backing Wall. Ballotpedia reports Wall had $2.3 million in cash on hand at the end of 2017, making her by far the best-funded candidate in the race. In Texas Congressional District 3, Senator Cruz is backing Texas state Senator Van Taylor to fill the seat of retiring Rep. Sam Johnson. Taylor, a Marine veteran of the Iraq War, represents District 8 in the Texas State Senate. He previously served in the Texas House of Representatives, representing District 66 in western Collin County. In Texas Congressional District 5 Senator Cruz is backing former staffer Jason Wright to fill the seat of retiring Rep. Jeb Hensarling. Wright faces seven other Republicans, including Republican fundraiser Bunni Pounds, whom the Texas Tribune calls “Hensarling's handpicked successor,” and a state representative whose current legislative district covers a large chunk of TX-5. 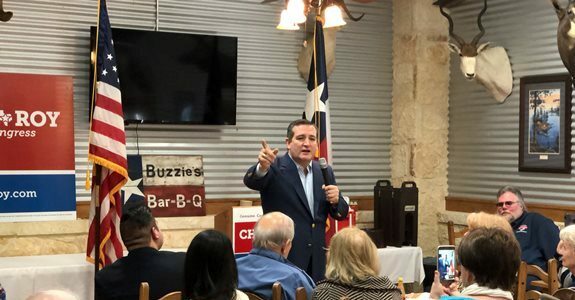 The Texas Tribune reports that during a weekend campaign tour, Cruz made several stops across TX-5 with Wright, regaling crowds with talk of Wright's unwavering support since Cruz's days as a low-polling, improbable Senate candidate six years ago. Wright was "one of the first 2 Percenters," Cruz recalled during an appearance in Sunnyvale, and once Cruz pulled off the upset, Wright promptly resigned from his post on the Tyler City Council and went to work for the freshman senator as his East Texas regional director. The race has also garnered the interest of our friends at The Club for growth. The Club’s super PAC has already unloaded a quarter of a million dollars on digital and TV ads attacking two of Wright's opponents, Lance Gooden and Kenneth Sheets, for their voting records on taxes in the Legislature reports the Texas Tribune’s Patrick Svitek. In Texas Congressional District 21 Senator Cruz is backing his former Chief of Staff Chip Roy to fill the seat of retiring Rep. Lamar Smith. That Chip Roy is THE principled limited government constitutional conservative in the race we can confirm from our many years of working with him, but Chip is, as Senator Cruz observed at a recent campaign rally, more than a conservative policy wonk – he’s a warrior and take-no-prisoners fighter for conservative principles. Svitek reports that Cruz is also working to introduce Roy, a cancer survivor, to voters in a more sympathetic light. In New Braunfels — and in a TV ad released a day later — Cruz argued "Obamacare is personal" for Roy, implying he has seen firsthand the problems with the health care system that both men believe stem from the Democrat-sponsored legislation that President Barack Obama signed in 2010. The 2018 Texas Republican Primary is March 6. We urge all of our friends in Texas to make sure they get to the polls and vote for the next class of national conservative leaders: Kathaleen Wall in Texas Congressional District 2; Van Taylor in Texas Congressional District 3; Jason Wright in Texas Congressional District 5, and Chip Roy in Texas Congressional District 21.